Didymosphenia geminata, aka Didymo, aka "rock snot", is a stalked diatom alga which covers rock surfaces in cold, moderate to fast flowing water. Since 2007, Didymo has been found at low concentrations during the summer months from around Hancock, N.Y., downstream to the area around Dingmans Ferry, Pa. (above the Delaware Water Gap), with high-density patches frequently observed in the cold-water zones of the East and West branches of the Delaware River, as well as in the colder zones of the upper mainstem Delaware River. In the spring of 2012, populations were confirmed on the mainstem below the Lehigh River confluence down to Trenton, but as a low-stalk form without its characteristic appearance. 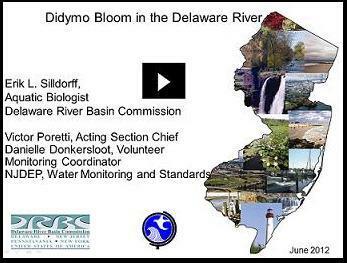 Didymo has been found in only one NJ tributary to the Delaware River, at the mouth of Big Flat Brook in the Delaware Water Gap Area, Sussex County. 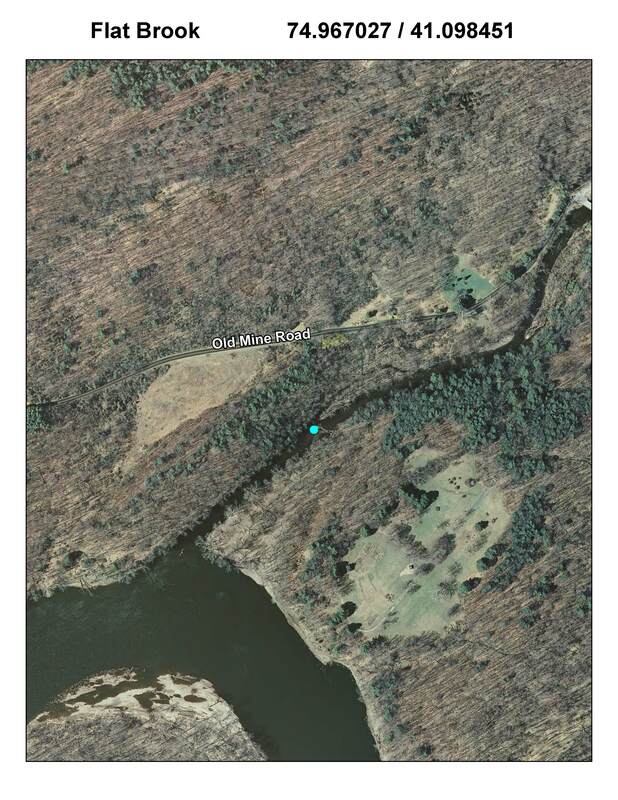 Please see map for location found and other areas surveyed by NJDEP/ BFBM. Click on the graphic below to view a webinar presentation of our recent Didymo findings, including recommendations on equipment cleaning and prevention of proliferation. For a map of the upper reaches of the Delaware see: https://www.nj.gov/drbc/library/documents/NonTidalMap.pdf . Historically, Didymo has been found in cool, clear, nutrient poor waters, but has expanded its worldwide distribution to include nutrient rich waters. While Didymo is not a public health hazard, and not an indicator of water quality problems, there is significant ecological concern with discovering the invasive algae to this extent and in these concentrations. Thick mats of Didymo can crowd out or smother more biologically valuable algae growing on the riverbed, thereby significantly altering the physical and biological conditions within a stream. Habitats and food sources important to macroinvertebrates and fish can be also smothered, forcing these organisms to migrate to more hospitable locations. Additionally, Didymo can easily attach to any fishing equipment, especially felt-soled boots, and the chance of it hitchhiking its way into nearby streams or rivers that currently lack this unwanted invader is cause for alarm. The risk is compounded by the bloom's timing with the beginning of trout season, when anglers flock to the river in large numbers. Didymo is a cold water species which tends to decline in concentrations as water temperatures rise. There is nothing known that can be done to remediate an area that has Didymo; the key is to prevent its spreading to other streams.